We have our first wedding of the year this weekend. It is a big year for weddings in our friend group. I think we have seven this year between now and October. Its been a couple years since we had a wedding season like this and I am so very excited to celebrate with our friends. This weekend I am wearing this black lace dress. It is a classic style with a cut out back and one of my favorites. One thing I love about it being such a classic style is that I don't care that I have worn it before or been photographed in it. Changing up my jewelry and shoes means that I can wear it more than once without it feeling like a big deal. I always get lots of compliments on it and its forgiving - I was even able to wear it newly postpartum last year and not feel frumpy. Of course, I'm more excited to wear it this weekend thanks to all of my recent workouts. With seven weddings this year, though, I am trying to add to my wedding wardrobe a little. I am such a huge fan of lace dresses, scallops, and pretty necklines or backs. Now that I'm older, I go for dresses that are both flattering and comfortable. Something I definitely didn't do earlier in life. I also try to avoid wearing the same color as the bridal party or anything that would majorly clash with what they are wearing. Black, navy, and blush pink are my favorite colors to wear as a wedding guest. Actually, I love wearing these colors all the time. I also try to choose things that are classic over trendy so I can avoid anyone looking at pictures later and wondering what in the world I was thinking. I usually consider these types of dresses investment pieces and always try to choose something I will get wear out of later, too. 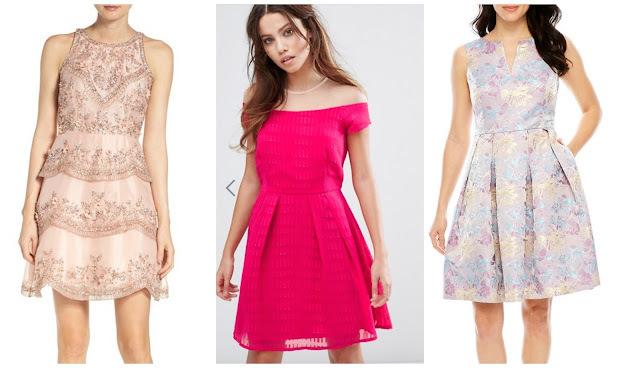 How do you go about choosing a dress as a wedding guest? That black dress is super cute! Love the classic look. I have a few wedding guest dress standbys from when I first started attending weddings. A simple black dress with ruffles that I bought for Lauren Evert and Hudson Smith's wedding! It's my go-to fall/winter wedding guest dress. A silk pink and gold Lilly dress that I bought for Allison Renfro's wedding! It's my go-to spring/summer evening wedding guest dress. A blue and green floral sundress that I actually bought when I was working at JCPenney. It's one of their more expensive brands, and it was so popular that it sold out at our store in its first weekend. Luckily my size was still available online. It's one of my favorite dresses. I even wore it for my own wedding rehearsal!